Education New Zealand has released its official enrolment report for 2015. It finds that international student numbers were up 13% last year to reach a total enrolment of 125,011. This marks a second consecutive year of double-digit growth for New Zealand, and the sharp reversal of a previous trend of declining enrolment from 2011 through 2013. That 13% enrolment growth translated into 14,748 more foreign students in New Zealand in 2015. But nearly all of that growth is accounted for by three fast-growing sending markets: India (+9,013 students in 2015), China (+3,881), and the Philippines (+1,648). And, looking back over the last two years, most of the overall growth in foreign enrolment has been concentrated in two sectors – Institutes of Technology and Polytechnics (ITPs) and Private Training Establishments (PTEs) – and it has been largely driven in both sectors by increasing numbers of Indian students. 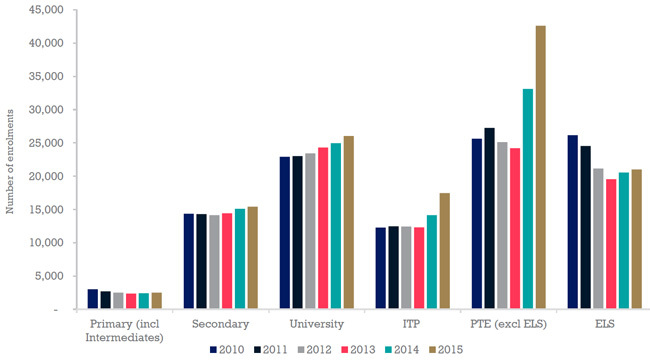 ITP enrolment climbed by nearly 42% over the two years, and by 23% between 2014 and 2015 alone. The PTE sector includes language schools and, while English Language Teaching (ELT) enrolment has been essentially flat over the last two years (+2% between 2014 and 2015), overall PTE numbers are up by more than 45% (including nearly 19% between 2014 and 2015). Increases in Indian enrolment accounted for just over 80% of overall ITP growth last year and about 60% of PTE gains. India’s significant role in driving recent-year enrolment growth in New Zealand provides an important bit of context for recent news reports of greater scrutiny of Indian applicants by immigration officials. Immigration New Zealand (INZ) recently revealed that 51 of the country’s tertiary institutions, including about half of all ITPs, have visa decline rates of more than 30% for Indian applicants over the six months from 1 December 2015 to 31 May 2016. INZ has indicated that visa applications are generally declined in cases where the department does not believe the applicant is a bona fide student, or where it has concerns that the applicant does not have sufficient funds to support themselves during their studies. Indeed, INZ has recently concluded audits of 10 institutions with high visa decline rates, and is reportedly considering additional immigration controls for providers with high decline rates. As the following chart reflects, foreign enrolment in New Zealand has become more concentrated over the past several years, and this in spite of coordinated attempts to open new sending markets. This is in part a feature of the significant Indian growth noted above. But it also reflects a decline in a number of established source markets over the same period, including South Korea, Saudi Arabia, Thailand, Japan, and Germany. As we see in the chart, four countries – China, South Korea, India, and Japan – accounted for 57% of total enrolment in 2010. That balance has shifted, however, as Korean enrolment has fallen off and as Indian student numbers have grown: China and India combined for 50% of all foreign enrolment in 2015. The diversification challenge indicated here varies somewhat by education sector. Where Indian enrolments skew towards IPT and PTE providers, the university sector relies more on Chinese students. “The university sector’s reliance on the China market has increased significantly, moving from 27% of enrolments in 2010, to 42% of enrolments in 2015,” says Education New Zealand. New Zealand is hardly alone in this respect. China and India have driven much of the recent-year growth in most leading destinations, including Australia, Canada, and the US. And in each case, those key source markets account for a significant share of overall international enrolment. What the 2015 numbers reveal is that the issue of diversification is now looming large in New Zealand and will very likely be an area of increasing focus for international educators and stakeholders there in the years ahead. This entry was posted in Australia/Oceania, Higher Education, K-12, Language Learning, New Zealand, Regions and tagged student enrolment, student recruitment, international students in New Zealand, foreign students in New Zealand, Institutes of Technology and Polytechnics.